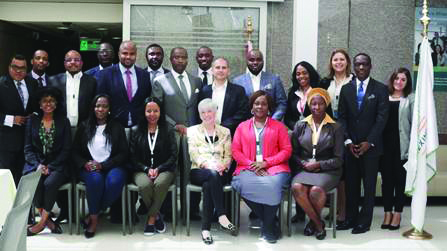 A cohort of 11 African trade finance practitioners have embarked on the 2019 version of the Certificate of Finance in International Trade (COFIT) offered by the African Export-Import Bank (Afreximbank) in collaboration with the FCI+IFG Union and the University of Malta. The 2019 COFIT cohort will be the fourth for the programme which was launched in 2016 with nine students. COFIT was developed to meet the demands of the commercial world and to offer a platform from which participants can increase their understanding of all aspects of international trade, import-export business, finance of international trade, supply chain finance and commercial finance (factoring, invoice discounting and asset-based lending), among other areas. COFIT 2019 is being delivered in English in four full-time modules of one week each, with two weeks in Malta and two weeks in Cairo. The first week to be delivered in Cairo began on Monday, 8 April 2018. Afreximbank offered partial scholarships of 50 per cent to five students from African partner organizations to attend the programme to enable them gain essential insight, awareness and understanding of international trade, both for career development and for enhanced skills development. Participating in the 2019 cohort from Afreximbank are Anthony Edordu of the Legal Department; Leila Sebunya of the Credit Assessment Department; Mohammed Salihu of the Client Relations Department; Benoit Messi of the Trade Finance Department; Pamela Mensah of the Banking Operations Department; and Ernest Ahiagbe, also of the Banking Operations Department. They are joined by Nneka Elizabeth Oshobi of Heritage Bank Plc, Nigeria; Ambrose Binafiai, also of Heritage Bank Plc, Nigeria; Fatima Tahwa of Paper Place Ltd., Zimbabwe; Rebecca Folake Bank-Ola of Adeleke University, Ede, Nigeria; and Farai Mutamangira of Mutamangira & Associates Clairwood Chamber, Zimbabwe.